When life gives you lemons, you make lemonade right? Although I love a nice tall glass of lemonade as much the next guy, there is so much more to lemons (and life) than just plain old lemonade. · When heated, creates salicyclic acid, which is a natural pain reliever. · When needing only a few drops of lemon juice, prick one end with a fork and squeeze the desired amount. · Lemon juice can be frozen for up to 6 month and still taste fresh. To freeze, place juice in ice cube trays. 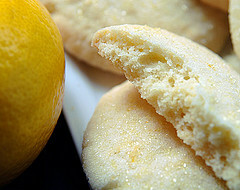 · When a recipe calls for fresh squeezed lemons, squeeze upside down to avoid seeds from dropping into your recipe. · To extend the shelf life of a lemon, keep them in your refrigerator in a clean jar, cover them with cold water and seal the jar well. · On his second voyage, Christopher Columbus brought the first lemons (and lemon trees) to America. So, when life gives you lemons, go ahead and make lemonade……. But, don’t forget the cookies!! ½ cup………………. powdered sugar for dusting. with olive oil cooking spray. salt. Mix until well blended. scoop into sugar and roll until well coated. Place on prepared cookie sheets. with powdered sugar. Pucker up, and enjoy!! !